The ultimate gift for the coffee lover in your life. 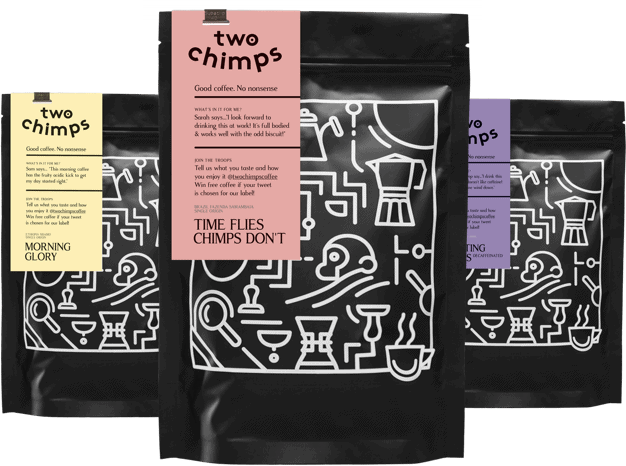 The first gift subscription is sent with a Two Chimps Coffee Tin and Magnet Set, a letter and a bag of freshly roasted coffee. Following 250g orders are sent in a letterbox friendly package, larger orders are sent as a small parcel. First class delivery is free on all deliveries. All of our coffees are freshly roasted in small batches and by hand. Our coffees are from a single farm or region in a particular country. Our exception to this is our one limited edition blend, which changes on a frequent basis. As all of our coffees are seasonal, every so often we will have to change them when we run out. Don’t worry, we will always send something yummy to enjoy that is similar, but if it not enjoyed as much as its predecessor, you only have to let us know, and we can swap it for something else. Just choose your roast style and time of day from the drop down below and we will send your coffee lover their fix. Want to mix things up a little? Opt for our mystery subscription instead and we will send a different freshly roasted coffee each time. Just think of all the coffees they can try. Ready to order, but don’t want us to post just yet? No problem. Let us know upon checkout and we will send on the date specified instead. Go on, you are just a few clicks away from present giving greatness. Learn more about our coffee subscriptions here.